Talk about having the camera pointed in the right direction at the right time! 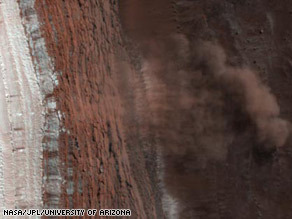 Check this out ... an avalanche on Mars, courtesy of NASA's Mars Reconnaissance Orbiter or MRO. MRO is one of three spacecraft currently in orbit around Mars. Its onboard camera shot the avalanche on February 19 as part of a routine photo survey of the icecap covering the north pole. The dust cloud caught the sharp eye of Ingrid Daubar Spitale of the University of Arizona, Tucson, who works on targeting the camera. Scientists say the avalanche is a mixture of carbon dioxide ice and dust that is tumbling down a 2,300-foot slope at the edge of the icecap. Exactly what triggered it is unknown - but could be part of the springtime thaw, a Mars-quake, or a meteorite impact. And if there was any doubt about the high resolution of the MRO camera, check out this picture of the Earth and Moon from Mars, also just released. Trivia question of the day: What's the distance between the Earth and Moon? Answer here. to tell you the truth, this looks like something in my closet. It doesn't look like an image from space nor does it look like an avalanche. Am I the only one? Wished I had that kind of resolution on my camera. This should be the bulk of our space program for the future! I don't know what you keep in your closet. Maybe you should buy yourself some books on geology or some with satellite images before you make a comment on a science related page. Try going to the NASA site to see the images before they are zoomed in to get an idea of scale. Maybe then it won't look like some vanilla chocolate ice cream dessert you stuffed into your closet. perhaps your eyes are not all that tuned to depth. it clearly shows the top of the cliff/mountain with snow and the huge drop to the floor where the dust is puffed up into huge clouds by the falling of the ice/snow. mars will not be the first step to galactic expansion of the human race unless they can teraform and create an atmosphere. we already have buildings on earth where you have to live inside closed quarters and only go out for brief periods of time...they're called prisons! Is Mars experiencing "Global Warming" also? Hey Al, are we causing this too? "Is Mars experiencing “Global Warming” also? Hey Al, are we causing this too?" Wish someone would succeed at putting a microphone on Mars. Wind gust, not avalanche. It would be nice to have more details on this image as well as a wider field of view. That secret film studio at Area 51 must be huge! Have they used MRO to take some hi-res shots of Phobos and Deimos yet, or are these not on the agenda for shooting pix? Also does MRO have video capabilty or only static pictures, as impressive as they are?